FreeMax Scylla SV Tank features 2ml e-juice capacity, top refill design, airflow control system and 0.25-0.5ohm sub ohm atomizer head, compatible for freemax SS/Kanthal/Ni200 coil. FreeMax Scylla SV Tank features 2ml e-juice capacity, top refill design, airflow control system and 0.25-0.5ohm sub ohm atomizer head. 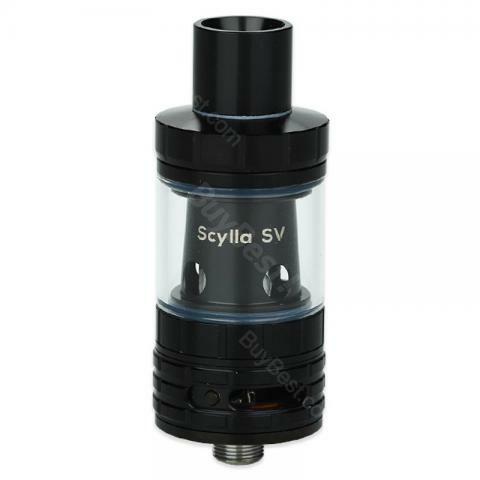 FreeMax Scylla SV Tank Atomizer is compatible for freemax SS/Kanthal/Ni200 coil and support wattage from 20W to 120W. Scylla SV Tank Atomizer comes with insulation material large drip tip, your lips will not have hot feeling although under continuous smoking, and it's a great choice for electronic cigarettes lovers who like huge cloud and pure taste. Black color available. • You can buy replacement ceramic coil and clapton coil. The sv tank delivers original flavor of my liquid. Ultimate subohm tank from freemax, as good as the Starre. I like the juice flow control design. No leaks tank. I bought this for my boyfriend and he like it very much. Stainless steel construction and pyrex glass tube make the Scylla so elegant on my mod.